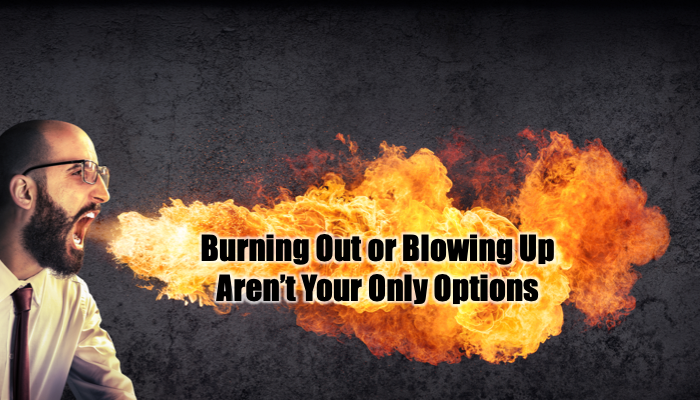 I talk to so many people who are about to burn out or blow up. They’re working too many hours. They feel like they are under heavy stress. They’re not hitting their personal or business goals. For example, I was talking with Josh (not quite his real name) earlier today. He’s a good guy, works hard, has a great product, and his customers love him. Out of frustration, he called me for a sympathetic shoulder and a little executive coaching because he knew I’d have some actionable wisdom for him. Yet people forget, you can’t make the resourceful decisions required to compete without having a clear mind and energetic body. You feel burnt out and out of control when you’re tired and depleted, don’t you. “Fatigue makes cowards of us all” observed General George S. Patton. You must be the priority if you’re going to be the problem solver. Most everything can wait a day, won’t it. Eat a healthy, delicious meal. Then you’ll tackle the problem with a clear mind and solid energy. I made Josh put these activities on his calendar with the same commitment as a customer call. We went over Josh’s list of what’s working well in the business: solid margins, happy customers, growing revenue. Then we discussed why this was working: correct pricing, support systems, a formal and funded marketing plan. This made him feel better because he’d lost sight of his gold in the midst of the mud. That’s what executive coaches do: we make you strong, not wrong. We remind you about what you forgot and then add new ideas that accelerate a solution. I sent him the recording and transcript of our discussion for his review tomorrow morning. If you feel like your situation is out of control, get someone you trust to help with insight and to help you separate the trees from the forest. You’re too far gone to do it yourself. Asking for help isn’t a sign of weakness, it’s a sign of wisdom. Executives get help all the time. They hire help. They ask for help. Even I need help from my advisors — and regularly. In fact, I had a conversation yesterday and today and it brought sharp focus and crystalline clarity to a project that I was too close to. Made all the difference, I’m back on track. Need a skilled, experienced executive strategy coach? Want to double to 10X your business in the next 12 – 24 months? Then let’s talk. I deliver results and insist on high ROI.